Before the current Frost Science existed, the museum team at the former location produced an interactive exhibition to learn what the community wanted in a science museum. The resulting public preferences included an outside sunlit space exploring the unique ecosystems of South Florida, a planetarium and exhibitions on outer space and human health. Each of these factors went into the briefs to architectural firms, as did the desire to expand the already strong marine science programs into an aquarium, and make the building and grounds part of the science exploration. In 2007, after a worldwide search, the selection committee, including representatives from Miami-Dade County and the City of Miami, chose Grimshaw Architects, a firm with a reputation for sensitivity to local conditions and a dedication to sustainability. Grimshaw has won over 170 international design awards including the Lubetkin Prize for the Southern Cross Station in Melbourne, Australia. 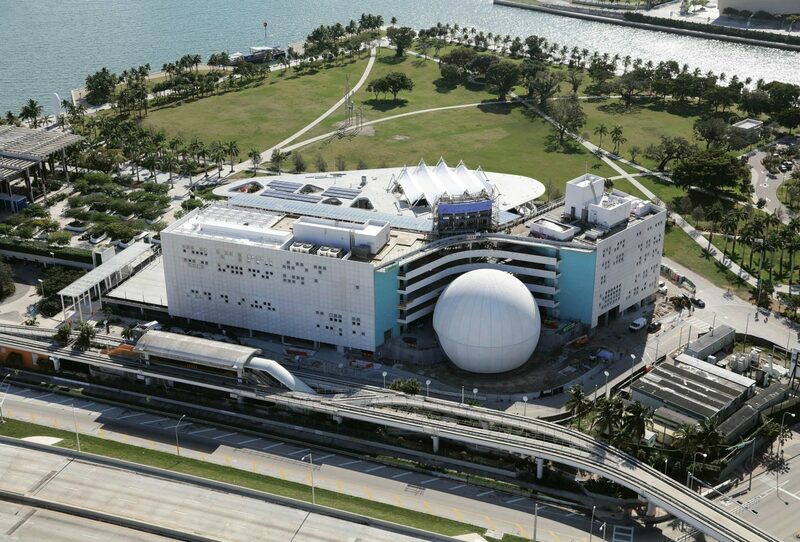 Frost Science sits in Museum Park, linking the buzz of downtown Miami and the aquatic life of Biscayne Bay—a fitting location for a museum exploring the natural and manmade worlds. Grimshaw responded to the site by creating a complex of four buildings with an open-armed stance facing the lawns of Museum Park, the prevailing breezes off Biscayne Bay, and views of downtown high-rises. This open posture connects the world at large to the science within, and creates a sense of indoor/outdoor synergy and access. It also maximizes cooling breezes, making the outdoor spaces enjoyable, and aiding in our LEED certification process. Frost Science’s visual ties to both the city and nearby marine habitats turns science into a conversation with real-world relevance. A key goal of the museum is to reduce the threshold to learning. Grimshaw imparted the site with a welcoming sense of openness in several ways. First, the structure divides into four buildings that relate to each other as if parts of a puzzle, but invite people to walk amongst them. The design expresses a “diverse building program which is similar to an overall campus with several buildings tethered together, rather than a singular building,” says Grimshaw. 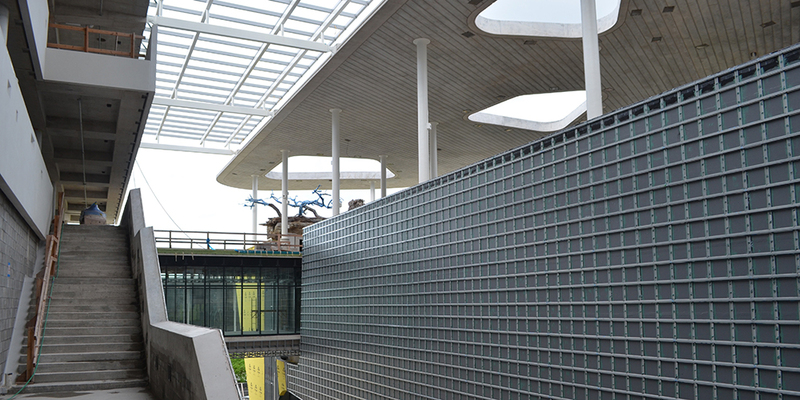 The open-air atrium that cuts between the buildings expresses a respiration of people and ideas, making the complex a dynamic environment that connects to the community and the ecosystems around it. The varied shapes of the buildings themselves create contrast and a sense of diverse worlds and ideas, yet are tied together through proximity and color. The North and West Wings form the open arms of the site. 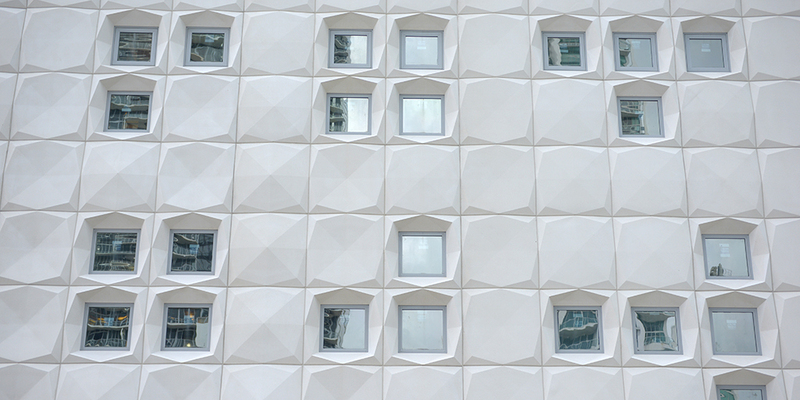 While their programing ranges from evolution to ecology to space travel, Grimshaw gave the wings a unifying in-and-out pixel geometry texture that plays with daylight throughout the diurnal cycle, allowing the arc of the sun to animate the façade. This texture also connotes patterns within science, be they plant cells or code for computers or DNA. Cupped within the wings is the Aquarium, which has an organic drip shape when seen from above. While the notion of a boat was not a driving idea in the design phase of the Aquarium, lateral views of the building offer graceful lines similar to the bow of a seafaring vessel. Sitting opposite the Aquarium’s oblong drip, the Frost Planetarium takes the form of an iconic sphere, evoking outer space and planetary exploration while standing out as an intriguing landmark across the street from squared-off urban condos. A soft white tonality unifies the campus, while dashes of various shades of blue signify meaning in different buildings: turquoise of the sea for the Aquarium, the dark blue of outer space for the Frost Planetarium and light blue of ocean breezes for the wings. The Aquarium, where many guests will start their science journey, is the heart of the site. To heighten the sense of scientific exploration and immersion, Grimshaw created a vertical experience where guests first encounter stunning aquatic ecosystems at the open-air surface level, then descend below the waterline into a more intimate and immersive interior space. The most dominant feature is the 500,000-gallon cone-shaped Gulf Stream Aquarium, which spans three floors and provides corner-less cruising for fish of the open ocean. 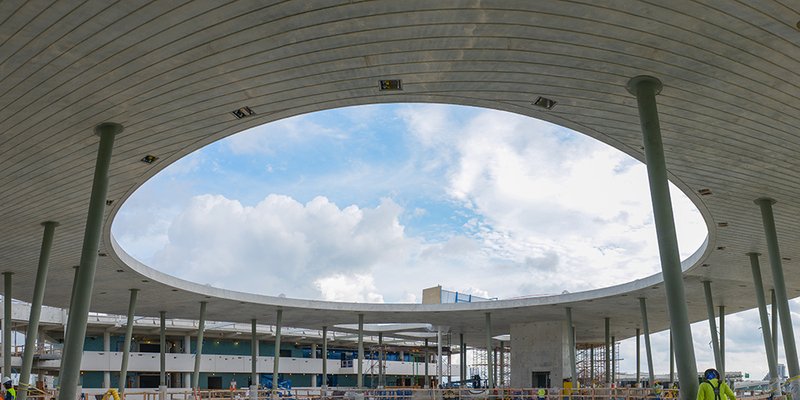 The bottom of the cone forms the ceiling of the Baptist Health South Florida Gallery, creating a dramatic exhibition and event space below, all while containing the stunning life of the Gulf Stream above.